In this course, the lectures are done by Dr Ray Pickett, Lutheran Seminary Program in the Southwest, Dr Sarah Henrich, Luther Seminary, and Dr Rick Carlson, Lutheran Theological Seminary at Gettysburg. In the course participants are introduced to key themes and issues in the New Testament, and learn basic skills to equip them to be faithful, creative interpreters of New Testament texts. The Introduction to the New Testament DVD presents a model for interpreting Scripture that emphasizes the importance of reading New Testament texts in their cultural and literary contexts with a view to relating them to contemporary cultural and ministry contexts. The course will focus on the practice of interpreting New Testament texts. Students will use the models and insights from presentations on the Select DVD to explore questions raised by the study of specific New Testament texts and then discuss how these texts continue to shape our faith and practice in today's world. Each session contains four 20 minute segments. The overall course can be taken online (offered in the fall) as preparation for teaching the course in smaller segments. Any single session could be offered as 4 unit course in a congregational setting. This course, in it's entirety, can also be used in preparation for the Associate in Ministry roster. 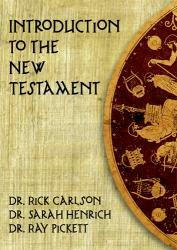 Introduction to the New Testament from Select Learning on Vimeo.